This is damage to the cartilage of a joint. Osteochondral injury or OCD is where there is also damage to the underlying bone. In the foot and ankle, the most common site is the talus bone of the ankle joint. Injury to this site is often referred to as Osteochondral lesion of the talus, or OLT. Damage to the cartilage is most common after an injury. 15% of all sporting injuries are of the ankle. Around 50% of acute ankle sprains have an associated cartilage defect. In athletes, 28-45% of patients with OLTs have associated ligamentous lesions. Football injuries has one of the highest frequencies of OLTs. 23% of patients with OLTs have chronic ankle instability (CAI). Patients may describe a deep-seated pain, worse on running. If they have associated instability of the ankle they may also have pain on the outside (lateral) or inside (medial) of the ankle. 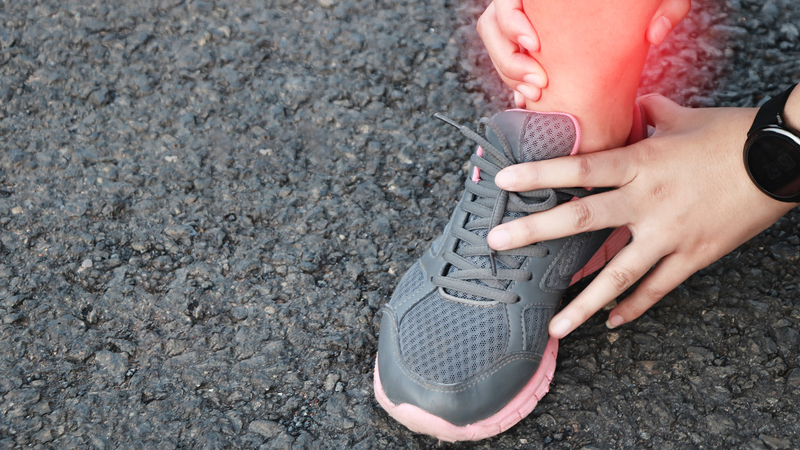 Sometimes they feel a ‘catching’ or ‘locking’ inside the ankle joint, and in some cases patients describe the ankle as ‘freezing’ or ‘seizing up’. Nearly always patients say they don’t trust their ankle and that the symptoms are worse on uneven ground. These injuries are commonly missed on x-ray. MRI is the gold standard as this can look at the cartilage and underlying bone. It also gives valuable information regarding the associated ligaments. Patients with ankle sprains that are not back to normal activities for them at 3 months post-injury, probably should have an MRI scan. Often patients with ankle sprains and injuries are first seen in the Accident and Emergency Department, A&E. They may be given simple advice or possibly referred to physiotherapy. If you have had a simple ankle sprain, you symptoms should improve back to normal over the course of one-to-two weeks. Persistent symptoms need further management. Ask your GP for a referral for physiotherapy. If you have had a course of physiotherapy, typically 3-6 sessions over a period of four-eight weeks, and your symptoms are failing to, or are slow to improve, make sure that you get referred to see and Orthopaedic Foot and Ankle Surgeon as you should have an MRI Scan to see if there is damage to the underlying ligaments and cartilage. R.I.C.E. Rest, Ice, Compression and Elevation in the first instance to reduce the swelling. Ankle brace or moon-boot for more significant injuries can be helpful. The most common operation is an ankle arthroscopy to look at the joint surface directly. For lesion <1.5mm drilling the surface of the bone (nanofracture, microfracture or retrograde drilling) can stimulate scar cartilage to form. For larger lesions of for <1.5mm lesions that have not responded to drilling, if the fragment is large enough, it can be fixed back to the talus. Techniques where cartilage is taken from another joint (knee) and donated to the ankle have been described with some success. Newer techniques with Bone Marrow Aspirate Concentrate (BMAC) with ‘Stem Cells’ and grafting the defect with porcine replacement cartilage (Chondroguide) or human derived tissue (GraftJacket) have been described and are showing promise. Surgery to the cartilage usually requires time for the cartilage to recover and reintegrate. A period of non-weight bearing is often recommended, usually about 6 weeks. Return to weight-bearing and impact sports is not usually recommended until after 6 months.